Kid Budget is a money management system aimed at teaching children the value of saving money and spending wisely. Kid Budget is the brainchild of Eric and Kim Daly parents to 7 children. This system was devised to fill a void that Kim saw when looking for a solution to teach her children how to manage their money. Many families give their children allowance and the Daly’s are no different. However she noticed a trend that there was always the want for more than what they were earning and she wanted to give her children a sense of financial understanding and to start that understanding at a young age. Kid Budget is her system and if the honest effort is put into this system if will be valuable life lesson you have the opportunity to pass on to your children. I have reviewed this system with my 12 year old daughter. My 12 year old insists that she is on the end of the spectrum of the ages this is intended for, but nonetheless she had only positive things to say about the system. I am also a mom to 7 kids and I have to agree, there are always so many wants that these children of mine have. My biggest lesson to try and teach them is for them to think hard and decide “Is this a WANT or a NEED?” The Kid Budget system takes that same want vs. need idea and teaches children how to meet all their needs with some “want” money left over. When I first opened the package from Kid Budget.com, I was very happy with the quality of all the supplies. The pouches and manual are well made and the children will adore the promise band, just make sure you have enough for all kids doing the system to avoid tears, trust me there! I would love to see homeschooling families get their hands on this. This is a valuable educational tool. Homeschooling families could go through this together. This covers so many educational areas. Math, critical thinking, life lessons, economics are just a few of the areas this covers. Even if public schools were to pick up on this, or a public school teacher was able to teach this system in the classroom setting with “school only” money, it would be a wonderful way to introduce children to the importance of saving money. I am very impressed with the work that has gone into this system and can say honestly that the costs involved in starting this system are well worth the lifetime lesson you will be teaching your children. Be sure to visit KidBudget.com. 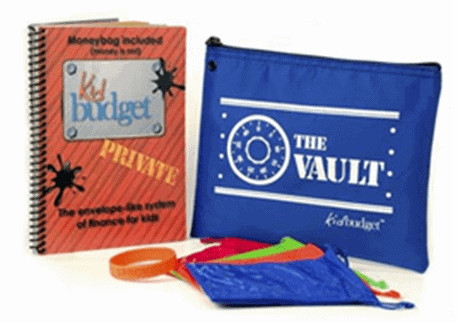 Not only can you purchase the Kid Budget system there, but it is a fun interactive website for kids. There are money facts and free printables that are all geared towards making money management fun and do-able. There is also a Kid Budget.com/blog. The blog is clean and crisp and give more tips an tools to use beyond what is in the Kid Budget manual. I would have no hesitation recommending this, it is a well thought out and conceived program.